With approximately 90' of street frontage and 370' of depth, this site presented an opportunity to create a cluster of small homes gathered around a series of landscaped common areas. Reminsicent of the delightful Bungalow Courts built along the West Coast in the early 1900s, this concept features homes that provide privacy while also promoting a sense of community. 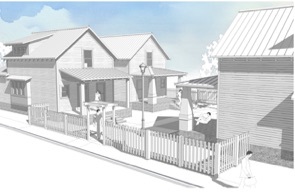 Located on an infill site, these six cottages all feature deep front porches and private side courtyards. 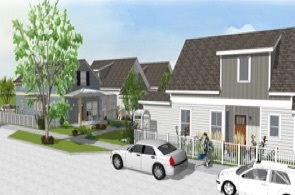 A rear lane allows access to one covered and one open parking space along the rear of the homes. 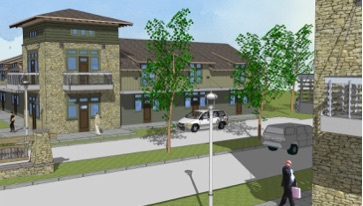 One and two story plans range from 938 to 1350 sq. 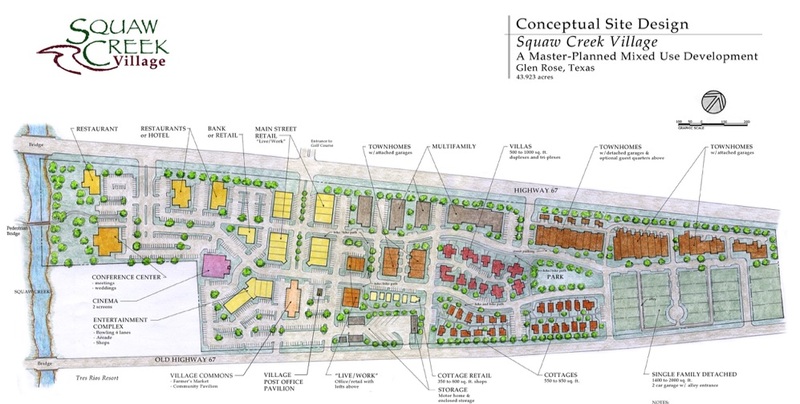 ft.
Clusters of smaller homes that focus on a central common courtyard. Parking is located along a rear lane with access to garages, or, in a dedicated parking area. 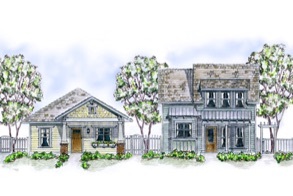 Inspired by the Bungalow Courts built along the West Coast in the early 1900s, these quaint homes are grouped around common courtyards. Although cars typically dominate a great deal of our lives, it becomes important that they do not overwhelm the integrity of each cottage. 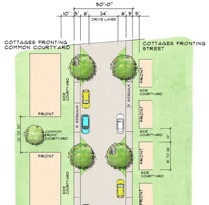 Therefore, parking is grouped either away from the homes or along a rear lane with access to a garage. Since residents walk from their cars along paths through the common areas and adjacent to their neighbor's front porches, there's always an opportunity to stop and visit or simply say "hello."